It's a shame that there couldn't have been a Carroll's-to-Grand Union-to-Steinberg's-to-Miracle Food Mart-to-A&P-to-Metro conversion in London. But who knows; maybe there's one somewhere else in southern Ontario. FWIW, there is at least one Grand Union-to-Steinberg's-to-Miracle Food Mart-to-Dominion-to-Metro conversion (minus Carroll's), but you may already know about that one. It's even been nominated for heritage status. London's history continues to surprise me. How so? It's interesting to see that the Carroll's stores in London (they were based in Hamilton IIRC) didn't survive long enough to be bought out by Grand Union. I browsed through a microfilm roll of the London Free Press from 1955 this afternoon, and what did I see? A Carroll's-Grand Union ad. It turns out that they re-entered the market a decade after Carroll's initial departure, and had a solitary store open at "Huron & Adelaide." Unfortunately no precise address number was given, but this is bound to be the same location as 1080 Adelaide St...which is a store that spent the 1960s doing business as Steinberg and the 1970s and 1980s as Miracle Food Mart. And that's not all! Grand Union also had stores (however briefly) in Ingersoll, Strathroy, Aylmer, and Delhi. This means that both of the mystery stores I posted last month have a chance of being Grand Unions...and possibly even Steinbergs. When you're talking about Delhi, is it Delhi in India or a city called like that in Canada? Sorry if the question sounds dumb, but if someone was talking to me about stores in London, my first thought wouldn't have been about Ontario ; hell, if I remember, there are even cities called Rome, Paris, St Petersburg and so on in the USA and Canada, so why not Delhi? Delhi, Ontario. It's a speck on the map that's currently home to one supermarket, and a "Tobacco Museum & Heritage Centre." Through some mixture of effort and accident, I've been able to unearth some historical photographs of London, Ontario grocery locations. Most of what I've found ultimately derives from the collection of London Free Press negatives at Western University's archives; though how I found them is all over the place: Some pictures surfaced in local history books, and I actually found one photograph of a store printed on a physical historical marker on Richmond Street! A few images are also available through Western's Archives Holdings Database; though only a small proportion of indexed images have been digitized for viewing online. 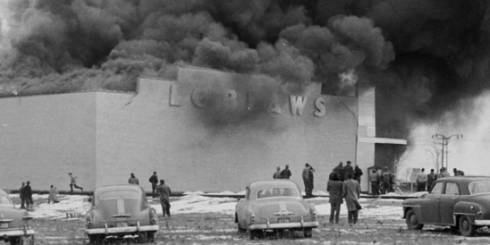 This is (er...was) a Loblaws store that opened at 1920 Dundas Street in October 1953. The building itself appears to have been representative of Loblaws designs of the period, with a porcelain-enamel facade and covered walkway. It barely lasted more than two months in operation: A fire broke out on 3 January 1954, completely consuming and destroying the structure. 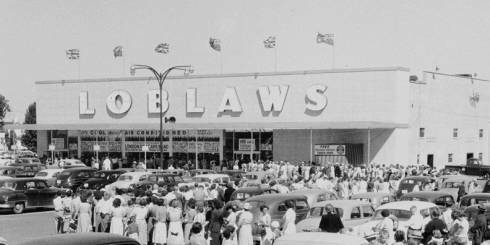 Loblaws pulled out the stops to rebuild on the site (likely on the same foundation, and quite possibly using the same blueprints), and a replacement store opened for business in July 1954. Here is that store on opening day, Union Jacks and red ensigns waving in the wind. This particular store managed to survive longer than two months without burning down...but it didn't survive the 1970s push for larger and more modern stores. A replacement Loblaws (still in operation as No Frills) opened across the street by 1975, and the 1954-vintage building appears to have ultimately been demolished for a small shopping centre that now stands on the site. Here is a vintage photo of 577 Hamilton Road, the same Dominion location pictured upthread. The image quality isn't too good, but judging by the modern BMO logo in the background and the car silhouettes, this had to have been taken in the 1970s. According to a book I found called A Collection from the Hamilton Road Area, this store opened "about 1952" and closed on 6 December 1975 in spite of fervent protests from senior citizens in the neighbourhood. The building reopened shortly afterwards as the independent Forest City Market, and went on to house an Asian market in the 1990s. I recently had the chance to step inside the building, and it's a true time capsule with original wooden floors and original doors. Unfortunately, the building did appear to have a porcelain enamel facade in its Dominion days that is now gone. Here is the Loblaws store at 234 Oxford Street East as it appeared in September 1965. This store was listed in the 1955 London directory, and it had been open for a little over a decade by this point. And scavenging a photo from upthread, here's the same store today, still doing business in the Loblaws fold after more than 60 years! The Supertest gas station is long-gone, and an Urban Outfitters store now stands on that site. One last historical photograph to round things out: 780 Hamilton Road, one of the very first stores that Dominion opened in the city. This store had its start in 1923, and lasted until 1946. This picture was taken on 2 March 1941, and it clearly shows how multiple storefronts were subsumed during the store's operational history: The address was listed as 780 in 1925, 778 in 1930-35, and 776-780 in 1940-45. The building still stands today, but some things mighty strange have happened to the brickwork. The front wall now has a stair-step motif at the top that wasn't there in 1941, and the corner door has been bricked over as though it never was...and with no obvious seams visible. Was the entire front brick facade replaced at some point in the last 78 years? Your guess is as good as mine. It's very odd. I'm also a little unclear about the provenance of this photo. It appears in A Collection from the Hamilton Road Area, a local history scrapbook I found invaluable for research. That book, in turn, credits the image cryptically to "200 Canada," which may be another history book or something else entirely.